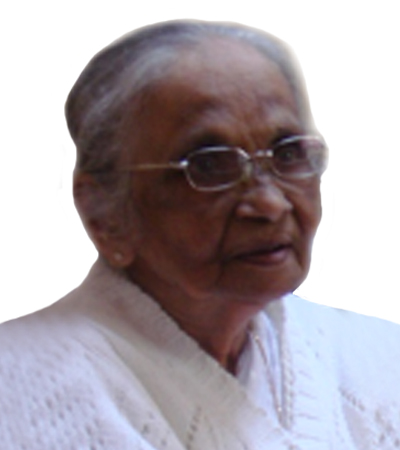 Grace Thavamany Suppiramaniam went to be with the Lord Jesus, surrounded by the love of family, at St. Mary’s Hospital, Kitchener on Friday 8th February 2019 at the blessed age of 100. She was born in Nunavil Jaffna and lived in Canada. Loving eldest daughter of the late Mr. & Mrs. N. A. Thambirajah. Loving Wife of late Suppiramaniam. Beloved mother of late Karunananthan, Dr. Kirupananthan. Loving mother-in-law of Raji, Madhu. Loving Cherished sister of late Suntherarasa, late Manoranjithamalar, Dr. Singarajah, late Ponmany, Thurairajah(Sri Lanka), Ratnarajah, Ariagunarajah, Christabelle(Australia). Sister-in-law of late Rajeswary, late Arulpragasam, Nesammah(Canada), late Selvarasa, Lohini(Canada), Ratnambal(Sri Lanka), late Bala Selvanayagam. Loving grandmother of Christine(Paulo), Marcus(Kusala). Beloved great grandmother of Carson, Bennett, Jack, Theodore. Fondly remembered by many nieces and nephews from around the world. Grace trusted in the Lord Jesus and she cherished the Word of God. She devoted her life to the service of her family. Her greatest joy was reading the Bible, singing hymns, and spending time with the family. “For God so loved the world that He gave His only begotten Son [Jesus], that whoever believes in Him [Jesus] will not perish, but have everlasting life.” John 3:16.